We showed you a number of set photos while the 20th Century Fox action sequel A Good Day to Die Hard was in production, but we haven't seen much of Jai Courtney, the young actor who plays the son of John McClane (Bruce Willis). 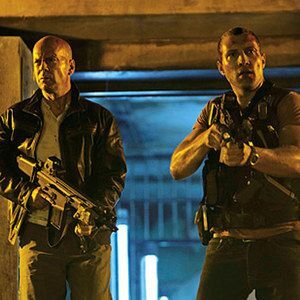 Today, we have the first official photo featuring both John McClane and his estranged son Jack, who must team up in Moscow to stop a nefarious Russian leader. Take a look at the photo, and read on to see what Jai Courtney had to say about the sequel. The actor first spoke about the personality differences between father and son in this new adventure. "The relationship isn't always functional. These are two guys who have been estranged for some time. John likes to wing it, see what happens. Jack's more of a strategist." He also spoke about how the ante is upped even further by placing these two in the unfamiliar environment of Moscow. "That's the thing about the Die Hard franchise, John's always a fish out of water. What could be further out of water for him than Russia?" When asked about the bad guys that the McClane's square off against, sadly, Jai Courtney wouldn't divulge any details. "I can't say much about the villains without giving it away."